In a time where the Empire's grip on the galaxy is still tenuous, take command of early Rebel luminaries or the Emperor's closest advisors in an epic struggle to define a galaxy still smoldering from the Clone Wars. Assemble your faction's war machine from dozens of asynchronous lines, then augment it with hundreds of potential upgrades. Transform aspiring heroes into legends to provide intangible leadership to your military and government. Leverage entire planets and civilizations to their greatest potential through base building. Then, when everything is in place, plot your conquest vector. This is a four-decade strategic simulation of warfare across 120,000 light-years. This is a commissioned fanon ship, released as an addon to Phoenix Rising at the commissioner's request. 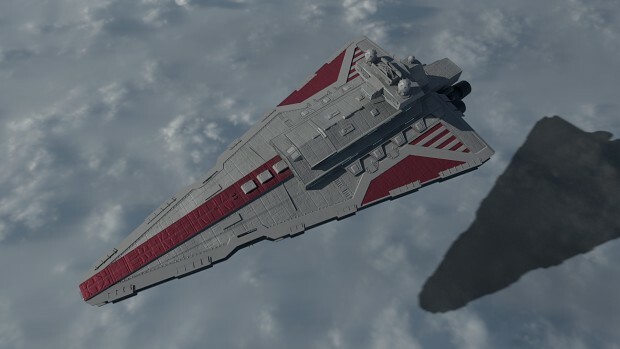 The Guarlara-class Star Destroyer is a modification of the "Guarlara", a Venator-class Star Destroyer that served in the Battle of Coruscant. It has been upgraded with enhanced weaponry and shielding, and stolen by the Rebel Alliance for their use. It can be produced at any level 4 orbital shipyard, then used to research the entire class of ship, when placed in orbit over a world with a level 4 orbital shipyard and research station. The ship class and hero can be upgraded. Unzip to your Phoenix Rising mod folder (in your Mods folder for ModDB version. For Steam, it is recommend you copy the mod from Steam\steamapps\workshop\content\32470\1235783994 to the classic Mods folder.). Allow overwriting any files. If no files are asked to be overwritten, you're in the wrong folder! No further installation support will be provided for this item. "Guarlara" model, textures and icons. Code to add Guarlara as a buildable unique unit, that then unlock research to produce Guarlara I-IV class star Destroyers. I like that you can still see the Venator within the design :) great work! Why does this keep appearing in my notifications every so often? This was released last year, we all know it was released last year... whats going on?